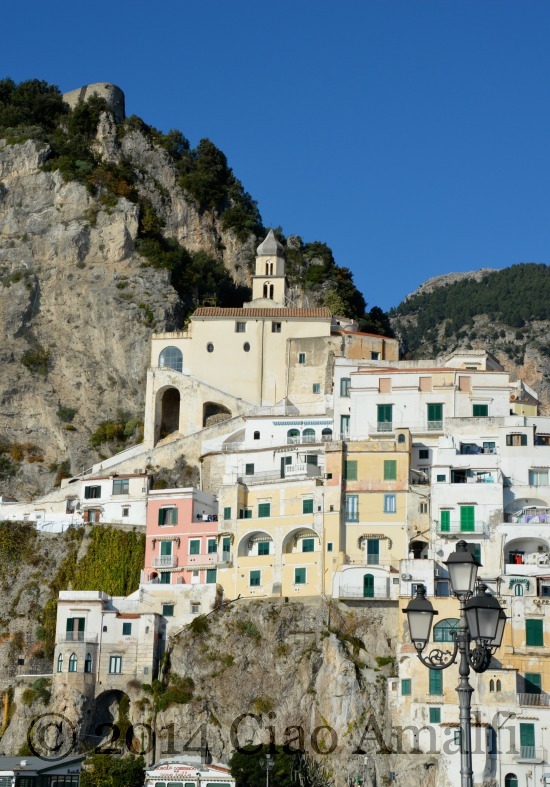 This week’s photo shows one of my favorite spots in Amalfi where you can see how the buildings were built right into and around the mountains. I love how they’re all stacked up on top of one another! At the top of the heap is the Church of San Biagio (or Saint Blaise). The zigzag staircase leads to the entrance of this church, which was founded in 1082. It has one nave and a lovely 18th-century ceramic tile floor, but unfortunately it is rarely open. Good to note before you climb several hundred steps to get there! I’ve only been inside one time years ago for a special mass for San Biagio, which is celebrated on February 3rd. Since that’s coming up next week, this Foto Friday features the Church of San Biagio! 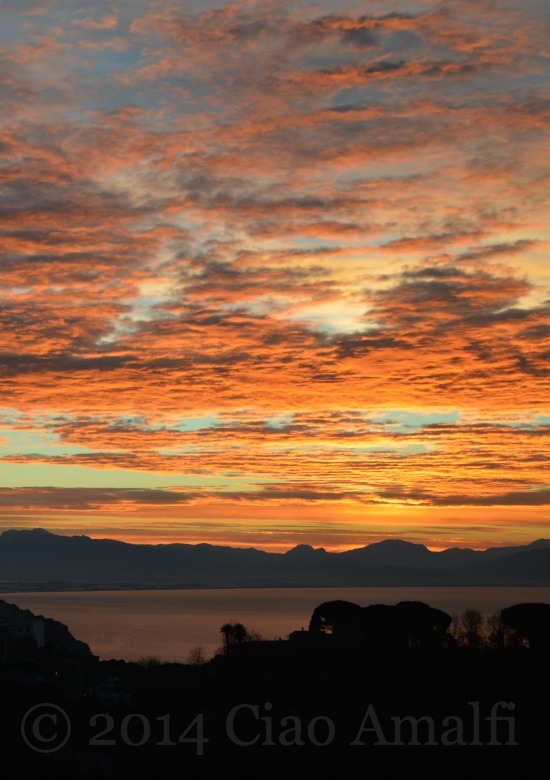 What a view to find outside the window this morning! This morning started in the usual way. Laying in bed I was already awake, as I usually am, and listening for the bells of the church next door to ring three times, three times in a row at 7am. Ding ding ding, ding ding ding, ding ding ding. Toulouse wakes up when he hears the church bells and meows. It’s time to start the day! Between making coffee for my husband and oatmeal for me, there’s a moment of chaos with our outdoor cats coming in and going out and Toulouse finding the whole process enormously entertaining. But there was something spectacular happening just outside the window, and I’m so glad my husband spotted it and called me from the kitchen to take a look! I spied the view out the window and ran to get my camera. Forget the coffee … the cats can wait for breakfast … all I could think about was trying to capture the orange sunrise to share with all of you. What a sight and what a way to start a Monday morning! The day ended up being quite grey and the rain began again this afternoon. You never would have thought with the way this day started! Wishing you a beautiful start to your week ahead! 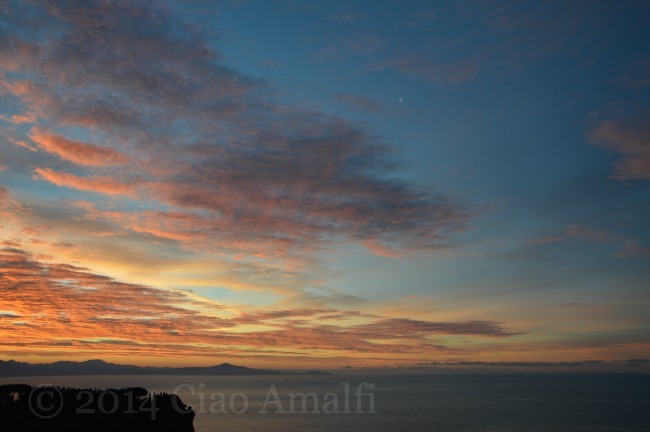 May it be as beautiful and peaceful as an early morning January sunrise on the Amalfi Coast. 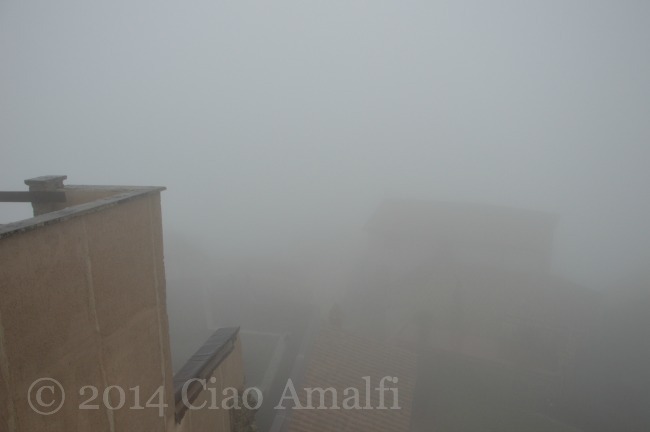 It has been a rather brutal week in the weather department on the Amalfi Coast, with seemingly endless rain and very strong winds. When the rain stops, I quickly lace up my shoes and head out for a walk. 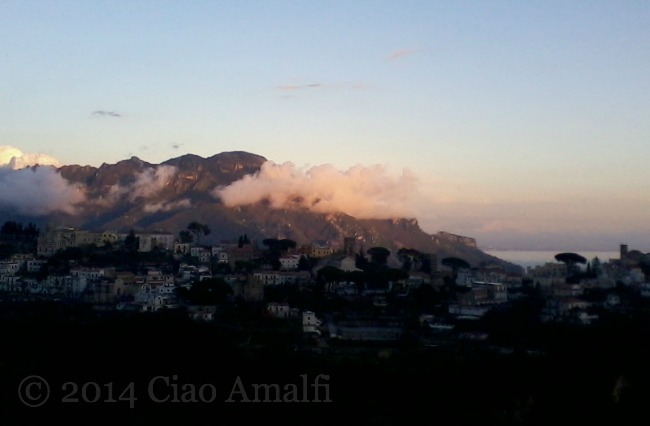 This is a view I caught last week while out for an evening walk, which seemed the perfect way to peacefully bring back the Foto Friday series on Ciao Amalfi. It has been ages since I regularly posted photos each Friday, but it’s just one of the intentions I have for my blog this year. 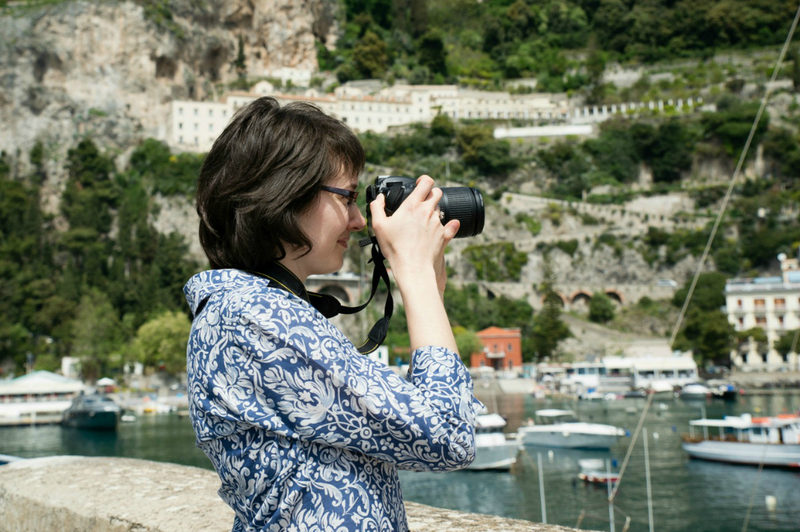 Wishing everyone a happy weekend ahead … with hopeful a great deal more sunshine than predicted for the soggy Amalfi Coast! The weather was glorious most of December! Just the other day a fan on the Ciao Amalfi Facebook page left a nice comment and asked if I was still writing my blog. Yes, I sure am! But, of course, not as frequently as I would like to be writing. It has been a busy period here with work, life, travels, the holidays and the unexpected adventures of a three legged cat named Toulouse. But more to come soon on that! So here’s a brief recap of what I’ve been up to since last November. I started off November with a trip back to the United States and a short visit to Minnesota to see good friends. It was beautiful! I caught autumn nearly at its peak and thoroughly enjoyed (and photographed) the gorgeous colors. I even got a chance to visit the University of St. Thomas, where I did my masters in Art History, and sighed when I saw the library where I spent so many hours of my life. Very happy hours! I then went down to Nebraska and spent two wonderful weeks with my family, enjoying time catching up, cooking and celebrating Thanksgiving early. 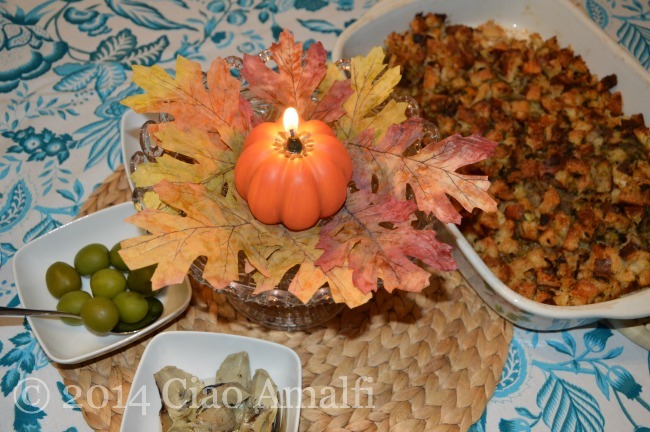 Then it was back to the Amalfi Coast for a week, where I did a big American style dinner for the actual Thankgiving with my husband. Before long I had to repack the suitcase again for a trip to Paris and London. You can read about the lovely time in London in my Smitten with Mayfair blog post, but here’s a peek at my favorite moment in Paris. 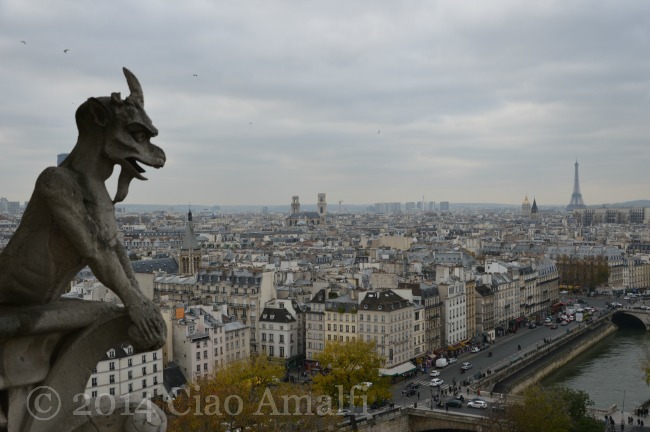 I finally got to the top of Notre Dame in Paris! Back home again and it was time for the holidays … but it was also time for Toulouse to have a big surgery. Remember when I introduced you to Monday back in September? Well, that cute little kitten has grown up to a sweet, feisty and very handsome cat. But unfortunately, the one leg that was injured very badly was able to be saved. This is Toulouse just before his big day! He’s doing great and has fully adapted to having only three legs. I’ll share more photos of Toulouse and hss adventures in a separate blog post full of cat wonderfulness and cuteness. But it was stressful over the holidays as Toulouse recovered and we tried to keep a rather rambunctious 5 month old cat calm. (Note: Impossible.) But the holidays came just the same and they were full of wonderful time with my husband’s family, delicious dinners and lots of sweets. 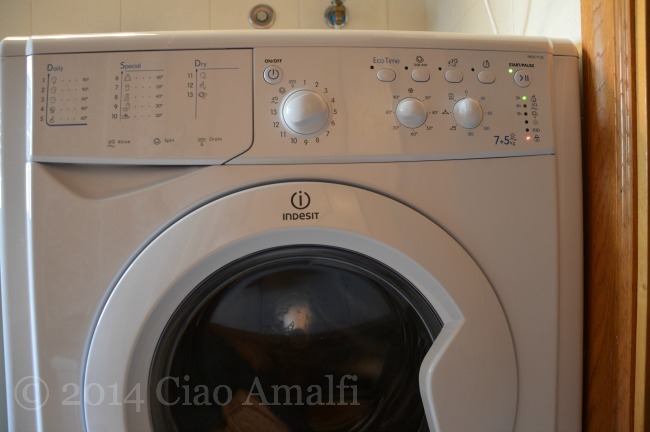 A washer/dryer combo - the best Christmas present EVER in Italy! Just after New Year’s we celebrated our two year wedding anniversary. Two years already! The weather was awful, but the day was beautiful. You’re just going to have to believe me, because this was the only photo I took. Fortunately the weather was better than this two years ago! Besides that particular day, the weather has been excellent and slightly warmer than usual for much of the winter so far. But as I write we’re in the middle of a nasty wind and rain storm. The shutters are closed and the internet comes and goes. Ah, winter! But when the sun comes out, everything is even more beautiful than before. Really, I promise. And so, that’s a look at the last few months. They’ve been wild, a little scary at moments, tremendously special and unforgettable. 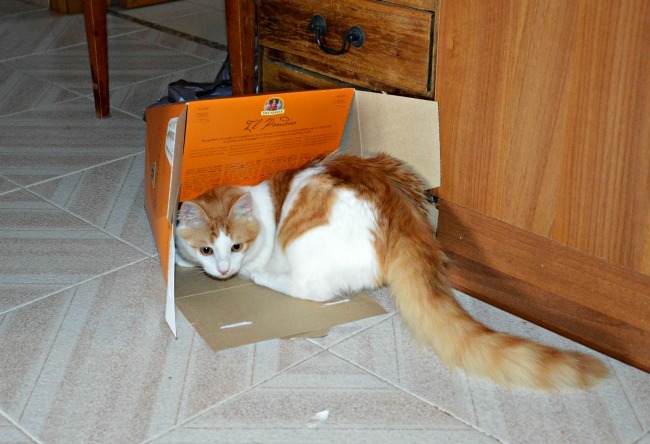 Especially Toulouse’s big puffy tail sticking out of the Pandoro box. "What do you mean there's no more Pandoro?" I hope the holidays have been a special time for you, too. 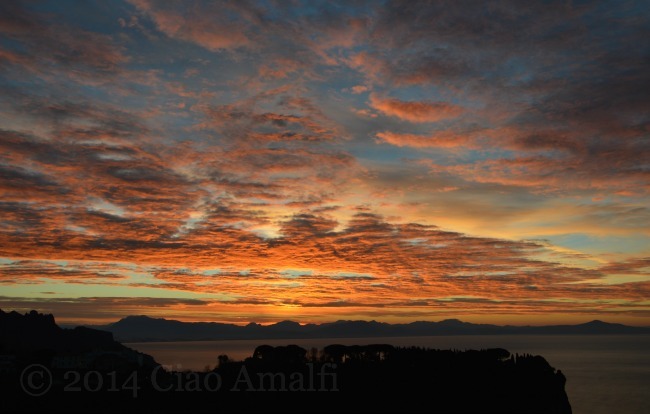 I look forward to the year ahead and to sharing more often here on Ciao Amalfi. I’ve got some exciting ideas for blog posts and a whole new design for the blog planned for 2014! 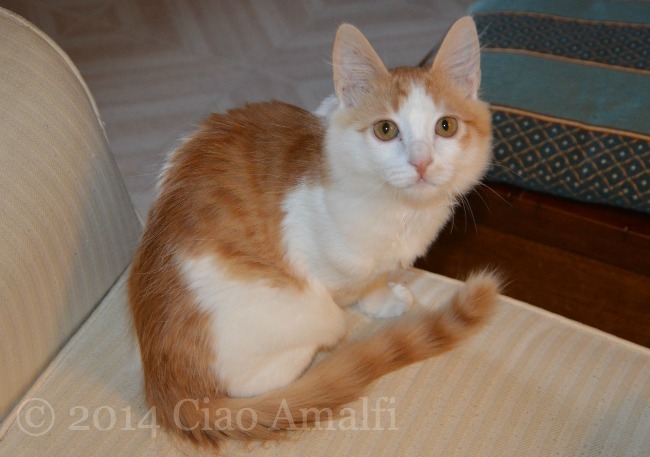 Happy New Year – Buon Anno! Ringing in the New Year watching the fireworks over Ravello! 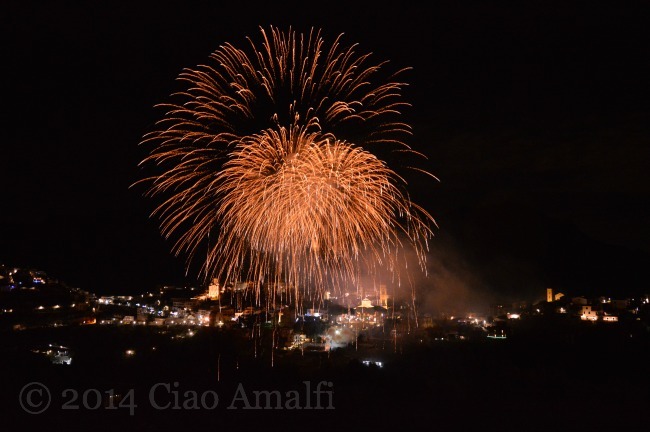 This year we counted down to midnight on New Year’s Eve with family in Ravello while watching the fireworks going off in Minori, Maiori and all up and down the Cilento Coast. Ravello puts on their Capodanno fireworks display after midnight and we were able to catch them from a spectacular viewing point in Scala. Wow! I hope everyone reading here had a lovely and memorable New Year’s Eve with family and friends. I’d love to hear how you celebrated! The beginning of a new year is favorite time for me – a time for reflections and intentions looking to the year ahead. I have many exciting plans for 2014, and I look forward to sharing them with you. 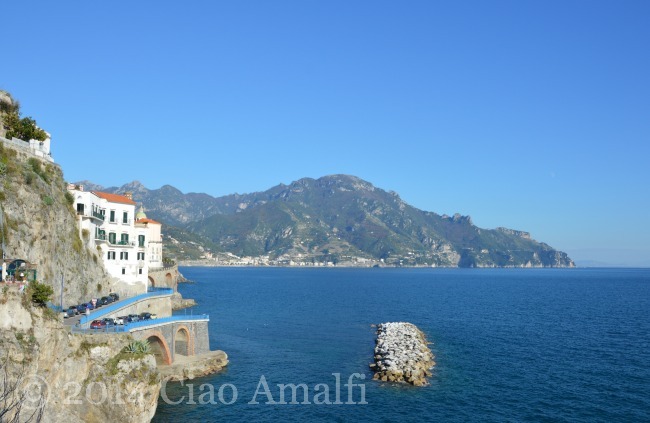 Stay tuned for some of the plans for Ciao Amalfi in the year ahead … buon anno a tutti!